If you are searching for the perfect gift for the doll lover in your life, consider a set of crochet fashion clothes. Not only are crochet clothes unique but they will stand the test of time and give any doll personality and class. There is something special about handmade clothes, even when they are made for a doll. 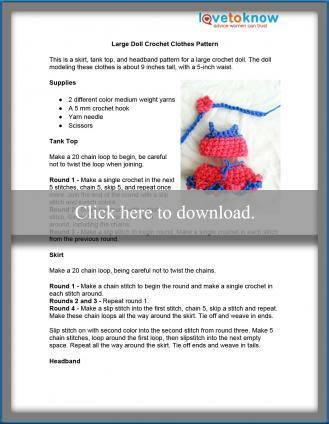 If you know how to crochet you will enjoy these free patterns. This is a skirt, tank top, and headband pattern for a large doll, measuring about nine inches tall, with a five-inch waist. Download and print the pattern for this outfit. Make a 20 chain loop to begin, be careful not to twist the loop when joining. Round 1 - Make a single crochet in the next five stitches, chain five, skip five, and repeat once more. Join the end of the round with a slip stitch and switch colors. Round 2 - Begin the round with a chain stitch. Single crochet into each stitch around, including the chains. Round 3 - Make a slip stitch to begin round. 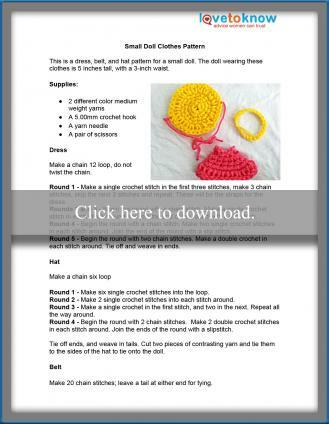 Make a single crochet in each stitch from the previous round. Make a 20 chain loop, being careful not to twist the chains. Round 1 - Make a chain stitch to begin the round and make a single crochet in each stitch around. Rounds 2 and 3 - Repeat round 1. Round 4 - Make a slip stitch into the first stitch, chain five, skip a stitch and repeat. Make these chain loops all the way around the skirt. Tie off and weave in ends. Slip stitch on with second color into the second stitch from round three. Make five chain stitches, loop around the first loop, then slip stitch into the next empty space. Repeat all the way around the skirt. Tie off ends and weave in tails. Make a 25-stitch chain, leaving a long tail at the beginning and end to tie onto the doll's head. Flower: Make a 4 chain loop. Make a slip stitch into the loop and chain three, five times. Leave a long tail and sew the flower to the headband. Put the clothes on your doll and loosely tie the headband around her head. This is a dress, belt, and hat pattern for a small doll. The outfit will fit any doll measuring about five inches tall, with a three-inch waist. Download this free pattern for doll clothes. Make a chain 12 loop, do not twist the chain. Round 1 - Make a single crochet stitch in the first three stitches, make three chain stitches, skip the next three stitches and repeat. These will be the straps for the dress. Rounds 2 and 3 - Begin the round with a chain stitch. 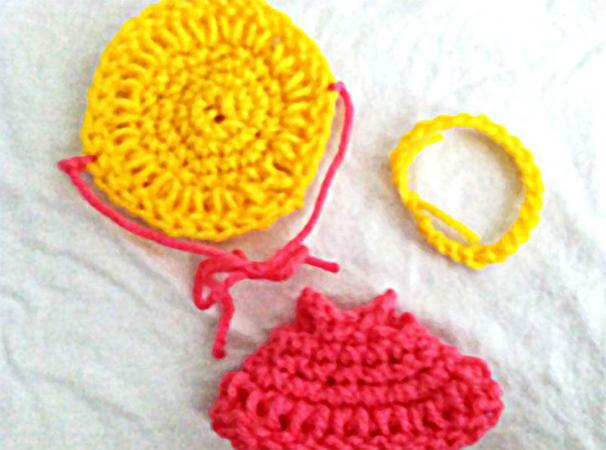 Make a single crochet stitch in each stitch around and join the end of the round with a slip stitch. Round 4 - Begin the round with a chain stitch. Make two single crochet stitches in each stitch around. Join the end of the round with a slip stitch. Round 5 - Begin the round with two chain stitches. Make a double crochet in each stitch around. Tie off and weave in ends. Round 1 - Make six single crochet stitches into the loop. Round 2 - Make two single crochet stitches into each stitch around. Round 3 - Make a single crochet in the first stitch, and two in the next. Repeat all the way around. Round 4 - Begin the round with two chain stitches. Make two double crochet stitches in each stitch around. Join the ends of the round with a slip stitch. Tie off ends, and weave in tails. Cut two pieces of contrasting yarn and tie them to the sides of the hat to tie onto the doll. Make 20 chain stitches; leave a tail at either end for tying. Put the dress on the doll, tie the belt loosely around her waist. Tie the hat around the doll's head. Once you determine the size and model of your fashion doll, take your time and browse the many available sources for the perfect free patterns. CrochetnMore recommends using chenille yarn and a size K hook to make this cute doll hood. Dustbunnies has a cute jumper with matching buttons. Use worsted weight yarn and a G crochet hook. Buttons or snaps to match are also needed. Crochet Pattern Central has an amazing collection of patterns, including Halloween costumes, hoodies, theme outfits and more. Bev's Country Cottage offers dozens of patterns for guy and girl fashion dolls. While there are lots of options for crochet doll clothes patterns, don't be afraid to create your own exciting and unique pattern. Measure the doll and craft a truly one-of-a-kind outfit that any little girl will love. If you are feeling especially motivated, make a look-a-like outfit for the doll owner.